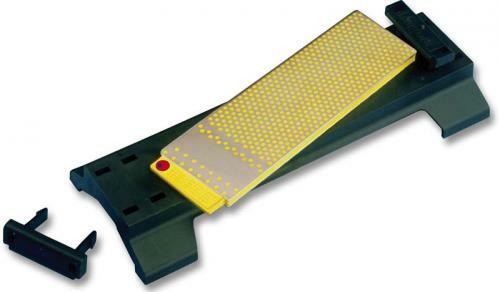 The DMT DuoSharp Plus Bench Stone is a double sided/two grit diamond whetstone with an interrupted main surface, and a small continuous surface for sharpening smaller knives and pointed tools. This DMT DuoSharp Plus Bench Stone has 8" x 2 5/8" sharpening surfaces with fine and coarse sharpening grits, and is packaged with the adjustable DuoSharp base. The DMT DuoSharp Base adds a 2" work height to the DuoSharp Bench Stone knife sharpener. The base is made of a strong but lightweight polymer plastic, and has non-slip rubber feet. Easily removable clips (for fast grit changes) secure the stone, and adjust to accommodate the use of an 8" or a 10" DuoSharp bench stone. The base has a convenient integral handle on the back, that gives one the option of moving the DuoSharp like a file over a large fixed piece.